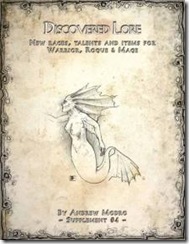 Warrior, Rogue & Mage is a simple, lightweight roleplaying game that allows a group of players and a game master to experience epic adventures in a fantasy world filled with wondrous magic. Although WR&M uses three basic fantasy RPG classes in its name, it doesn’t make use of classes. Players are encouraged to create their characters freely without having to fit them into archetypal roles. Warrior, Rogue and Mage are actually the character’s basic attributes, which measure their capabilities in combat, stealth and academics respectively. (http://radioactiveapedesigns.com) known for his post-apocalyptive roleplaying game Atomic Highway! 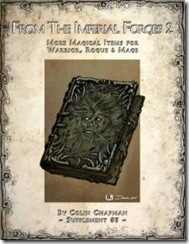 From the Imperial Forges 2 contains 19 unique magical items for your WR&M game created by Colin Chapman. Discovered Lore contains six new playable races for your Warrior, Rogue & Mage campaign. Smash your foes as a hulking Mountain Giant or explore the depths of the oceans as a member of the ancient merfolk. 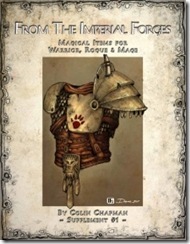 In addition to that this book provides you with new magic items and a set of sample characters that can be used as starting player characters or as NPCs. 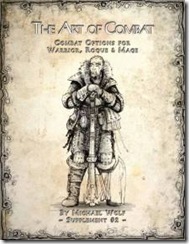 The Art of Combat contains alternate armor rules, new talents and rules for dodging and parrying attacks which help you to make combats in WR&M even more exciting without adding too much complexity. 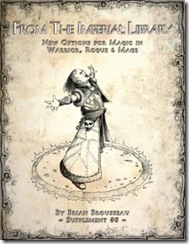 From The Imperial Library contains several variant magic systems, new and revised spells and talents. It’s the perfect supplement for players and GMs who want to turn WR&M’s magic to eleven! Looked over it, and it seems interesting at first glance. Expect more comments on my blog after I’ve gotten a chance to dissect it. Pingback: Stargazer's World » Blog Archive » Warrior, Rogue & Mage: Character sheet! Pingback: Stargazer's World » Blog Archive » Ask The Readers: What do you want to see in a revised edition of WR&M? Nice work! This looks awesome, the layout is very good and the art fits perfectly with the rest of the book. Not tested the mechanics yet, but it looks solid to me. Good job, and as always, I am humbled by the excellent work you produce. Pingback: Stargazer's World » Blog Archive » Preparing for Gen Con: Almost There! I love this game! At first, I was messing around with some different combat mechanic ideas but I think I’ve settled on the existing one plus a simple house rule of rolling a 1 always misses (some characters with low defenses would always get hit by certain other characters – they can’t ALWAYS hit, right?). Also, if a 6 “explodes” maybe say the 1 “implodes. ; ) Love the “exploding” dice rule, too – reminds me of DARO/TARO from T&T (another great game). Lots of other things to love about this game too. Do you plan to have more creatures/spells soon? This is a free game, so I don’t expect quick turnarounds by any means, but do you by chance have guidelines you follow for creating some that we could use? If you want to create monsters yourself just take the exisiting ones as examples and play around with the stats. There are no guidelines. This is a great game played it last weekend with some friends. Now working on a 14th century version for Mike. It is so open which allows the GM to make it his own. Which allows you to surprise the players. I added a fear effect for a encounter in the game we played. 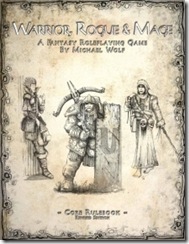 I really like the look of W,R+M, but I’m confused about combat: does someone who’s being attacked roll a d6 to try to avoid the attack or is it just the attacker’s total bonuses+1d6? Also, how would you stat Gnolls for this game? (They are one of my favourite races in D&D so I’m curious about how they would transfer to W,R+M). The core rules don’t have any hard rules for avoiding attacks aside from Defense. I’ve recently posted about additional combat options like parrying and dodging attacks on this site, perhaps you want to check that post out. Hmm, I haven’t thought about Gnolls yet. I would probably give them the following attributes: W4, R3, M2. Natural Armor of +1 sounds fitting and since they prefer using axes in combat, the Axe skill would make sense. I would calculate HP, Defense and Mana like for human characters. Perhaps you can increase HP by a few points to make them tougher. Done! Thanks for the information (I meant about using Gnolls as PCs: I came up with my own stats, Tough as Nails (-2 damage from each attack), Bite (never unarmed, deals 1d6 damage, uses Warrior), Outcast (-3 social interaction checks for non-Gnolls,), but I was curious about what you would choose for them. Incidentally, do you know of anyone who plays this game online? (I don’t know anyone in real life who has an interest in this sort of game and nobody else who I know thanks to the internet seems to interrested). Or open your own thread in the PbP forum here at Stargazer Games. Thanks. 🙂 I tried singing up for the forum but I can’t seem to be able to do it for some reason. (I got a message saying that I couldn’t register at this time when I tried to register). I’m trying to log in using my Gmail password but it isn’t working and I don’t have accounts with the other things which can be used. That’s weird, because I use Gmail to login myself. Please try again and use your full email address. If that doesn’t work, use just your username (without @gmail.com). Basically both variants should work. And make sure you don’t block pop-ups. I’ve tried those ideas. They still won’t work sadly. Great set of easy to use RPG rules. Very flexible, and allow interesting character generation. Looking forward to more supplements and rules. Pingback: This guy has some mojo! (the Sunday roundup) « . .lapsus calumni. .
Pingback: WR&M: Play report « . .lapsus calumni. .
My gaming group is using this as an in game break during our main campaign and love it. The rules are are so light and comfortable that the GM handed us each a character, explained the rules in 5 minutes, and we were off and playing. In an hour and a half we made it through the first part of a story arc, had a sideline quest, and complete 4 rounds of combat (14 enemies total). And we’d never heard of the system before tonight. Great game all around. Thanks! Pingback: Real Old School « . .lapsus calumni. .
Great system – been playing with it for a while now, and it’s found what I think is the perfect mix of being rules-light and still comprehensive. The light, fast rules have allowed me to run a game that started face-to-face, and seamlessly(?) transition it into an online game via videoconferencing after the young’ins bedtime 😉 Many of the players had never heard of the system before, but within just a few minutes were up to speed and are now the “core” of the campaign as others have fallen off. Thanks for producing a system that’s allowed this crusty old gamer to get back into things. I’m not sure if this is the right place to ask this, but I have a quick rules question. All of the other game rules make sense to me, but the wording on the Orc racial berzerker confuses me quite a bit. How exactly is this intended to work? The wording of the ability almost seems like it would grant a sort of invincibility as long combat continued. However I doubt that’s what you actually meant for this ability to work. Yeah, that’s how it was intended to work, at least partially. I think I forgot to mention that when your HPs drop under a certain threshold you actually die. And if the fight was particularly heroic I would allow the berserker to save his life using a fate point. Thank you for responding so quickly! Sooo.. might I ask about this threshold you speak of? How do you defeat an NPC with this ability? Hmm, I would probably set it to HPs equal to the character’s Warrior attribute. Or something along those lines. By the way, it would be great if you could join us in the official Stargazer Games forums over at rpgtabletalk.com. I may just do that. Thanks for all your help, have a pleasant evening. For the Berserker you could get them to make a warrior roll with a DL = to the minus damage +5. So once you reach -2 you need to make a DL7 roll. Gives a uncertainty to how long you can keep going. That’s actually a great rule. I like it!